This raw jam is not only easy and quick (possibly the quickest jam you’ve ever made), but it also has a very deep and intense flavor you’ve probably never tasted before. And yes, you can use it just like regular jam – smear it on crepes, use it as a topping for pancakes, make a PB&J sandwich with it, add it to smoothies or dressings, or just eat it with a spoon. I have already talked about grandma’s acreage and all the produce she grows when I shared a fruit roll ups recipe with you. In that recipe post, I also mentioned that she makes jam. Of course she makes the classic (canned) jam. But she is also famous for her refrigerator jam, which is exactly what it sounds like – jam you store in the fridge instead of the pantry. More often than not, grandma will actually use dried fruit for this jam. She cooks the fruit first (we’re not gonna do that), and then stores it in a clean, sterilized glass jar in the fridge. 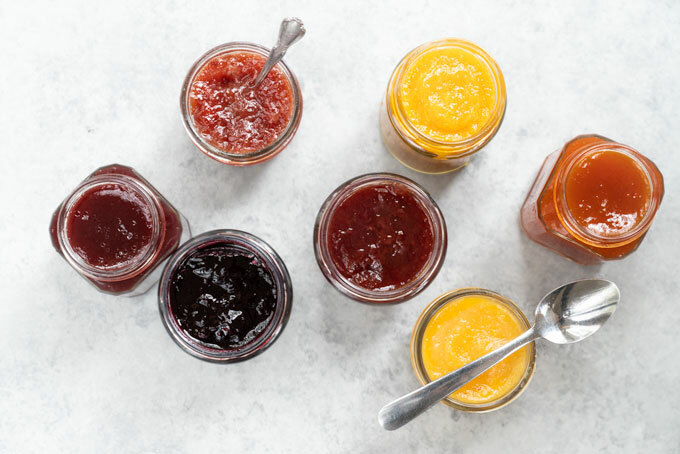 Making jam is simple. Canning isn’t. But even without canning, grandma’s refrigerator jam lasts in the fridge for quite some time. Maybe not years, but definitely a few weeks. Anyway, one should always exercise caution and common sense when consuming preserves and condiments, whether store-bought or homemade. Use a clean, dry spoon every time, close the lid tightly and store promptly back in the refrigerator, and you should be fine. Fail to do any of these, and even a perfectly canned product tends to spoil. Fresh fruit is definitely the most common for making jams and preserves. But I’ll let you in on a secret: starting with dried fruit will give your preserves uncommonly deep flavors. Dried fruit has very little moisture, leaving only concentrated essence of fruit. The juicier the dried fruit, the better. 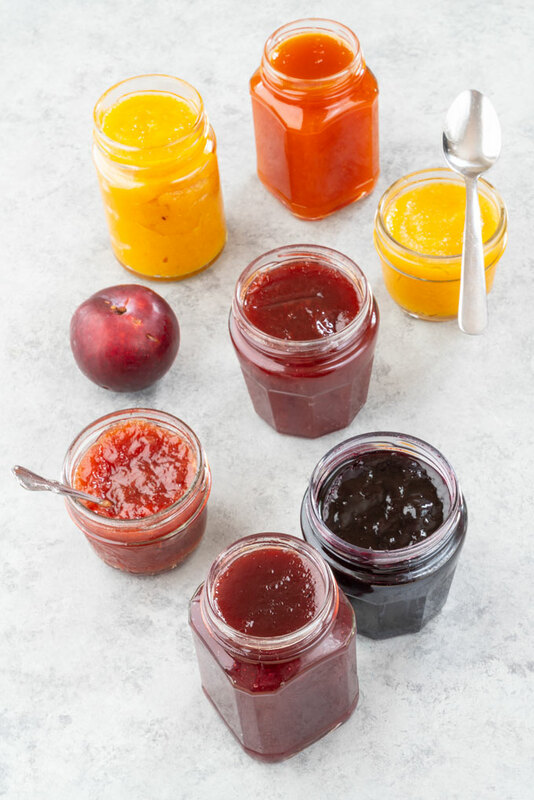 I have made this raw jam using apricots, plums, cherries, and figs, and they all work great. Dried fruit is also perfect for creating that thick consistency you expect from a classic jam without having to add any thickeners. The jam lasts in the refrigerator quite some time because the high concentration of sugars in dried fruit prevents bacterial growth. Dried fruit is also commonly treated with preservatives. The most common are sulfites, which not only prevent bacterial growth, but also preserve the fruit color. Without preservatives, all dried fruit becomes dark-colored. However, I do try to purchase sulfite-free sun-dried fruit whenever possible. While it doesn’t have the prettiest color and perhaps spoils quicker, it’s chemical-free, which, in my opinion, is worth it. If you’re not working with particularly sweet fruit, such as dates or plums, you might also want to add a little bit of a sweetener. I prefer maple syrup (or any other liquid sweetener) because the liquid consistency helps with blending. 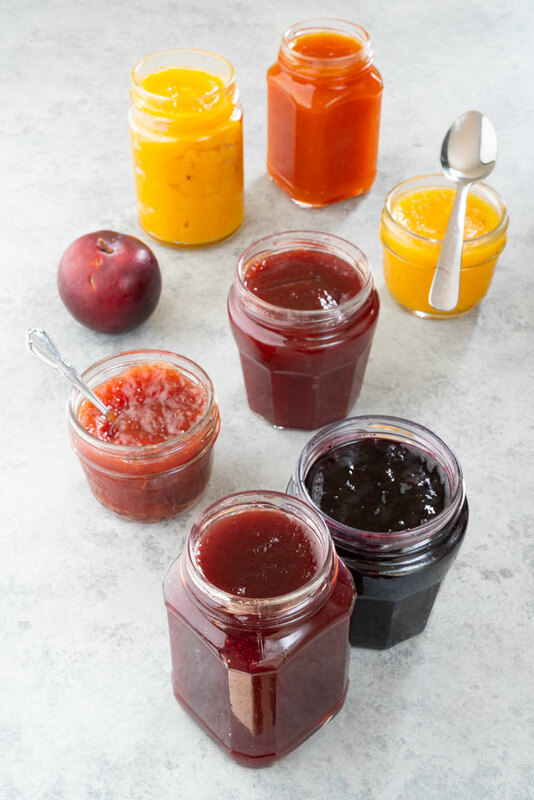 You might have heard that liquid sweeteners are not ideal in jams because they don’t adequately react with the fruit to set it. Well, that’s not a problem for this recipe because we are not cooking the jam. Any flavorings are completely optional. Lemon juice, vanilla bean, ground spice … feel free to add anything like. I like to keep my jam pretty simple, but do always add a pinch of salt to bring out the sweet flavor of fruit. Since dried fruit contains less moisture than fresh, you’ll want to rehydrate the fruit first. You can either soak the fruit in lukewarm water for a few hours or do a quick soak in hot water for a few minutes. Re-hydrating makes the fruit soft and easier to blend. To process the dried fruit into raw jam, you’ll need a high-speed blender, ideally with a tamper (I use a Vitamix) or a food processor. Add soaked dried fruit into a high-speed blender or a food processor together with the maple syrup and a pinch of sea salt. Blend until smooth. If your blender or a food processor have difficulties blending, add 1 Tbsp. (15 ml) of water (or juice) at a time. Store leftover jam in a clean sterilized jar with an airtight lid in the refrigerator for a few weeks. *Soak dried fruit until completely re-hydrated, about 4 hours. To quick-soak, pour boiling hot water over the dried fruit, soak for 15 minutes. (Note: if you do the quick soak, the jam will no longer be raw). So far, I have tried making this jam with dried apricots, cherries, figs, and plums, and they all work great. Whenever possible, purchase unsulphured dried fruit: apricots, cherries, figs, and plums. **Prep time does not include soaking (4 hours). This recipe has been adapted from Unconventional Baker.